Today is Merdeka Day! I haven't celebrated Malaysia's independence in many years, since my mom shipped us off to study in Singapore when I was 10, I have not been back for longer than a few months at a time and curiously, not ever around during elections and National Day celebrations. Well, this year, the Merdeka Day comes to us, in Paris. In a manner of speaking of course. Yesterday I received an email about a Malaysian food festival happening in the Meridien Etoile in the 17th arrondissement. What better way to celebrate than with food, no? Kids and dogs present a double challenge when it came to eating out during our trip to the Loire Valley. V didn't much like anything we ordered whether it came from the adult's or children's menu. On the first day, after a whirlwind tour of the potagers at Villandry we drove another 40 minutes to Chinon and settled on Le Grappa, an Italian restaurant that serves a good mix of local food as well as blistery thin wood-fired pizzas. Only problem was, as the evening progressed, the dinner crowd was mainly made up of sombre-looking couples who do not talk to each other. It seemed like we were the only table that had a conversation going. The lack of background music and general silence amplified the sounds coming from our table. It was very stressful when V got restless and Mimi barked when the waitress tried to come too close to play with her. What a relief when we could finally leave. Another unpleasant experience was had at the Leonard de Vinci restaurant right in the middle of the touristy square in Tours. We chose it because it was a recommendation in the Michelin guide of the area. The food was just about OK, but the staff were extremely rude. We were kept waiting for our main courses even though diners who came later were served their desserts. Their constant replies were "it's coming" and at one point the manager even told us, very loudly and at 3 feet away from our table, to be patient and to relax because it's holiday time. Other tables were asked if they wanted parmesan with their pasta, but we were not, even though we ordered the same dishes. After our prolonged dinner, the bill was so slow in coming I asked everyone to go ahead of me and board the car which was parked 3 blocks away (and to check on the Mimi and Rufus waiting inside). Still the bill did not come. After another 20 minutes, husband had to call me and then walk back to the restaurant to make a big fuss. At no point during our entire meal did any of the staff say "I'm sorry to keep you waiting." It was never their fault, and then they try to foist the blame on us instead. Even V was better behaved, she did not make any fuss over such a long meal. Fortunately this was the only place with such bad attitudes, most of the other eating outlets were more welcoming and friendly. The best dining experience was also the most unexpected. We had checked into the Mercure hotel in the city centre of Angers and decided to just eat at the hotel restaurant since it was a Sunday and wouldn't it be nice to leave the dogs in the room and husband could drink as much as he liked. Our table had a good view of the Botanical Gardens next door. To start with, we received amuse-bouches, unexpected but welcome, and it was tasty and appetising though I forget the details now. 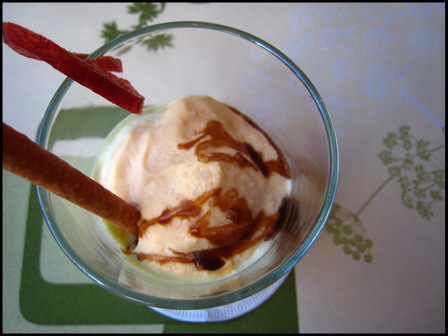 Then a starter of chorizo mousse with a parmesan straw for sipping it with (image above), delicious and amusing. A giant ravioli which was demolished quickly. Grilled steaks. Lamb. Chicken fricassee or something similar. Ham omelet for V which was nicely creamy inside if a little too salty for a child. Foams and balsamic vinegar flourishes featured a lot in the dishes but the flavours were kept clean and overall balance was good. Instead of desserts we opted for a cheese selection. Three cheeses came, I forgot to ask the names and even commented that one of them smelled like belly-button fluff but this did not deter anyone, even little V, from eating it all up because they were all perfectly ripe and pretty amazing tasting as good cheese can be. It was a lovely end to a relaxing meal and we walked up to our rooms feeling very contented indeed. Finally she figures out how to type French accents. This morning I signed up for a new term of French classes, which should keep me well occupied the whole of September. Lord knows I need a more structured routine. The past three months had all but drifted away with not much to show for it. A few trips out of the city and visits by friends and family were some high points, but honestly, the rest of the time passed in many hazy days of waking up late with sporadic bursts of yoga, reading, sewing or the occasional foray into the outside world to dust off the cobwebs. It was all very restorative and I am even starting to like it here. 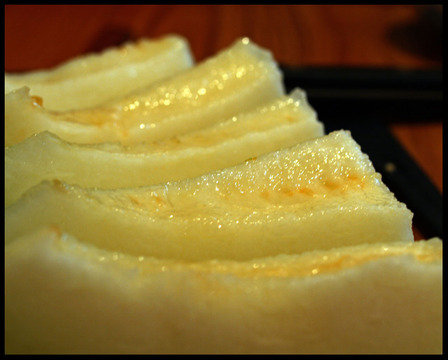 Of beautiful white fruits of peaches and figs, so sweet and juicy we don't even bother to peel the skins. Of tomatoes of many strips and hues. Sliced and swirled with olive oil and scatter of sea salt. With good bread to mop up the bottom of the plate. Of so so much of courgettes, eggplants and peppers. In all shapes, sizes and colours, all very flavourful and eats well whether raw, stirfried or added to the occasional curries and soups. I am too lazy to make my own ratatouille but Carrefour serves a pretty delicious version, no doubt they have plenty of leftovers to work with. Of butter that has to be consumed quickly! before they go all melty. Especially good paired with jams of weird but tasty mélanges like the melons with pineseed combination we bought at a market in Amboise. Speaking of Loire, it seemed like such a long time ago but we had a really good time. Lots of châteaux and wineyards. We never paid more than 4.50 euros for some rather excellent wines. Sweet whites from Vouvray, easy drinking yet characteristic vielle vignes (old vines) reds from the western sides of the valley. A mediaeval fair in a very old fort. 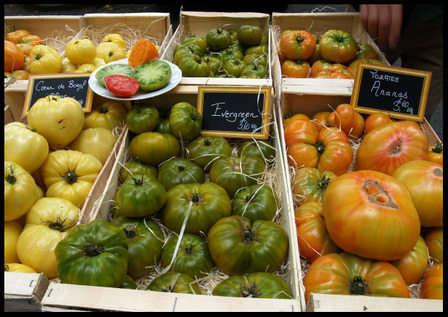 Outdoor markets. Beautiful dogs. Endless vistas of greens and blues. Rufus had a grand old time, he has become more confident and happy. Mimi, on the other hand, hated it very much. And they were not at all keen on either the dry or canned food, next time we'll have to find an apartment. V ate very little too, apart from the occasional pastries and ham slices. Husband is mumbling about the Dordogne next. Photos here, and there's still more to sort through. We're back in Paris, and C is in town. Blogging will resume next week. By the time this post appears, we should be on our way to the Loire Valley. Me, husband, V, GG, Mimi & Rufus. The laptop gets a much deserved rest too. I will try to cope with the internet-withdrawal symptoms by drinking their famous wines. There is just something about the hot and heavy weather that makes one not very hungry, yet when the stomach finally growls there is not much time to make anything too elaborate. Nor would anyone really want to anyway, it's too hot! A few weeks ago, the Minimalist Mark Bittman of the NYTimes shared his 101 recipes for quick summer meals which I noticed stayed in the "Most Popular" list of articles for a rather long time. And... here's mine. Only I am not so clever and can only come up with 11. But it's what we ate and have been eating, not just ideas and suggestions. 1. Fruits. 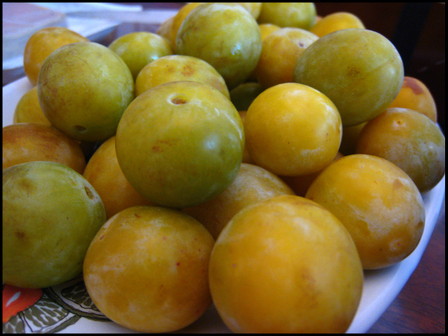 These Mirabelle plums are so cute and made for all-day snacking. Apricots, peaches, prunes, dates, all good too. We put a dish of fruits in the middle of the dining table and sometimes we manage to finish it all! If not, it's a good excuse to put it into a buttered dish, sprinkle some juice or liqueur plus a bit of sugar and cover with crumble for dessert- of course this would up the time requirement considerably. 2. 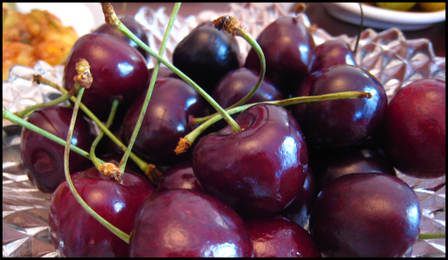 Cherries are below the plums in ranking only because one has to yank out the stems in addition to spitting out the seeds. 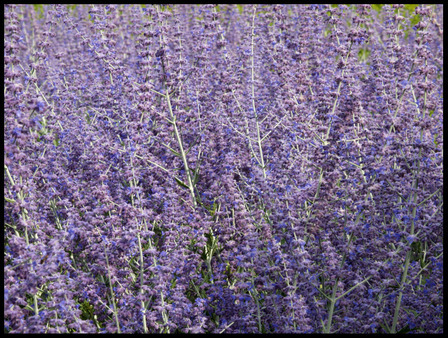 They are one of my favourite fruits and I have been known to down great big bunches of it for dinner. We are also seriously considering whether we need a cherry pitter. I do think that cherries are so much nicer than all the pretty vibrant red berries which call out to me at the market but which I know is too too tart for my palate. 3. Melons. These sweet crunchy Spanish melons are so cheap now, only 2.50 euros. In Singapore I used to fork out $15 ( ~ 7 euros). I know, it is a bit more effort to cut up and de-seed, but they are versatile. Add a couple slices of salty ham and voila, appetisers. 4. My very guilty secret. 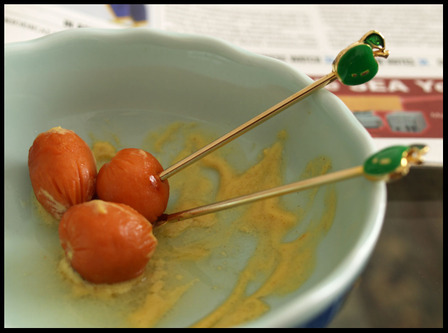 Eaten cold, it is as quick to assemble as the fruits, but I like to zap them in the microwave for one minute so that the briny juices seep out and mingle with the mustard to make a sauce. 5. Sandwiches. Cold meats are nice. 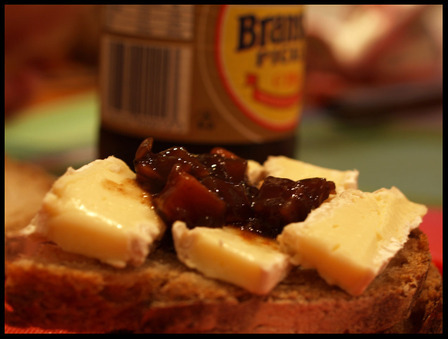 A ripe brie from a stall in Bastille market that specialises in this particular cheese, thanks to a tip from my good friend Sui Mai, makes it even nicer. 6. Fried rice. Excellent if you have leftover rice. Add eggs, onions and vegetables. We opened our stash of bak-kwa and pork floss in the spirit of quick, tasty and just that bit trashy cooking. 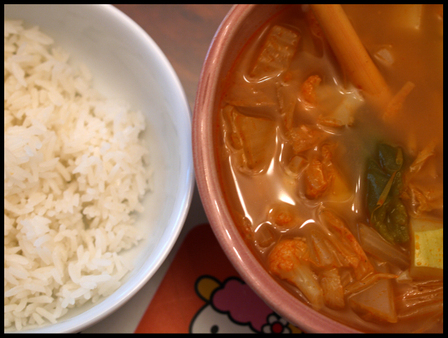 The soupy thing in the background was actually meant for the dogs, but I thought it was chicken stock because of the aroma and only realised my mistake when I noticed the rice grains and vegetables floating inside. I'm sure Mimi didn't mind sharing. If it's too hot to fire up the stove, we make rice salad. I like to pour the vinaigrette-type dressing on the hot rice to let the flavours seep in, and then toss the warm rice with the other ingredients (smoked fish is my favourite, leftover fried chicken is fine too, apples are a must, maybe some finely chopped onions too) but not too thoroughly so that there is some clumped up tasty rice to ruminate on. Does not sound appetising I know, but trust me, everyone will enjoy it even if they may initially feel dubious, like my second sister and GG. And husband. Even Vera. Everyone. 7. 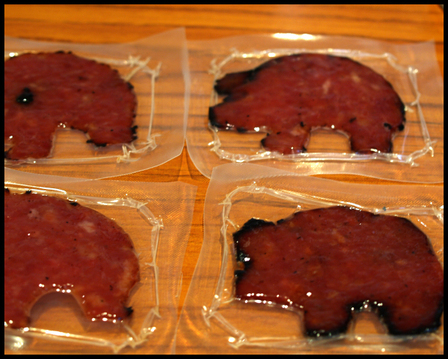 Bak-kwa comes in piggy shapes. Good for making sandwiches too. Takes 10 seconds to rip the packaging open. This is also the time to eat hams, jellied meats, terrines and pates. Support the bouchers and charcuteriers who keep their store open while everyone else (Pierre Herme, Mariage Freres, Marche des Enfants Rouges, etc etc) deserts the city. Ditto too for ice creams. And especially for pastries and bread, we should salute these heroes who work with ovens when it is 35 degrees outside. 9. I don't know about other people, but my salads always taste too healthy and vegetal to me, probably because we are not that liberal with the use of oils and dressings. Instead of salads, when we see the long Romaine lettuces in the market, known as "yau mak" back home, GG and I would immediately think of stir-frying them with fu-yu (fermented bean curd cubes). 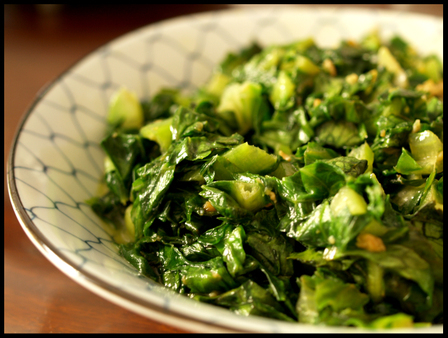 A quick toss in the wok in the garlicky, salty sauce tempered with a hint of sugar, and we have a plate of healthful tasty greens to go with rice. 10. 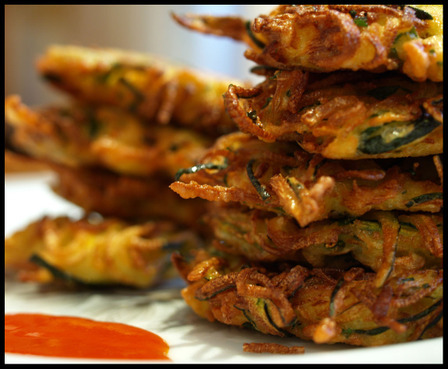 My friend w made some zucchini fritters the other day and the pictures of it on her flickr site made me salivate. 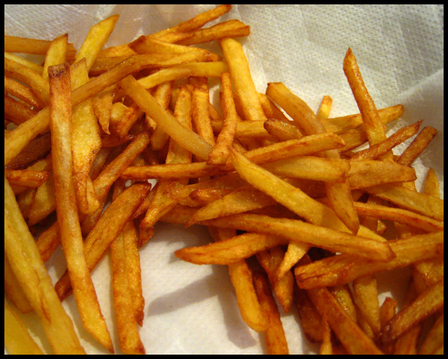 So we rustled up some for ourselves, or rather I googled the recipe and GG fried. We served it Singapore style with chilli sauce, light yet satisfying. Finally, let's not forget too that today is Singapore's National Day. We will certainly toast Majulah Singapura and think of our friends in Singapore when we make the rounds of the chateaux and vineyards. Cheers! 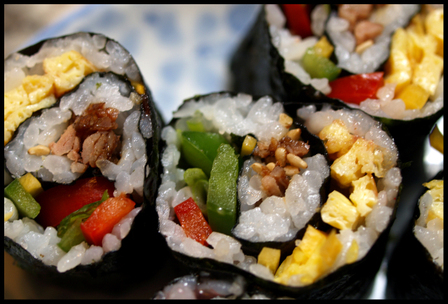 Not futomaki, Not kimbap, more of a Hybrid Roll actually. With a quickie braised cha-siew in the filling. 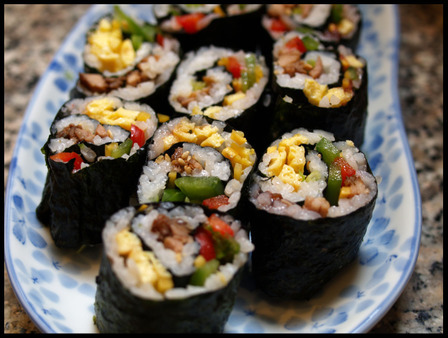 As soon as I saw Su-Lin's of Tamarind and Thyme's entry on kimbap I knew I had to make some. But there wasn't any Japanese rice or nori at home so we had to wait until our next grocery run to Tang Freres. Meanwhile, Mia the Skinny Epicurean, went on a similar vein and made Futomaki. Seaweed rice rolls seem just right for the hot weather we are having right now, they keep well(ish) and the colours are so happy-making. We finally made some and loved it so much we made another lot within the same week. But mine are strictly speaking neither kimbaps nor futomaki. The rice is seasoned with sushi seasonings rather than sesame and perilla; I used bottled seasonings for convenience sake. 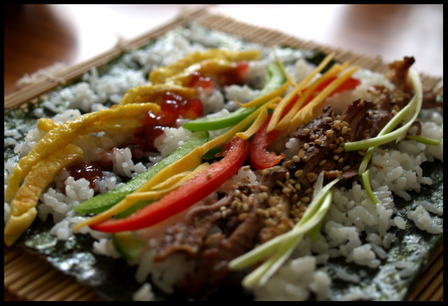 The fillings are a combination of cooked items and raw vegetables which nods at Korea with its sesame seeds but then again ginger notes allude somewhat to sushi. In the end we have a sort of Hybrid Rolls. Also, purists of both camps may balk at the braised pork filling. Well, I had pork in the freezer and thought it would be nice to make some braised char-siew. Now, char-siew, as everyone knows, is usually roasted but in my family we have a tradition of making a braised version. My maternal grandmother used to make it a lot because she didn't believe in buying the red-dye shop versions yet did not have an oven at home for roasting. 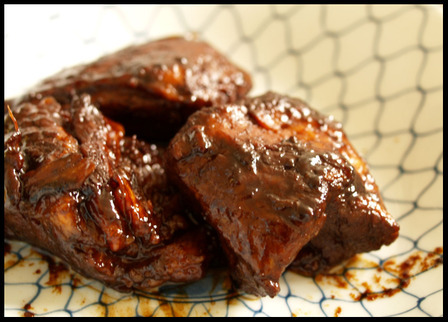 It is similar to char-siew in that the final product is glazed with a sweet and sour sauce derived from a lot of lemon juice, garlic and thick soya sauce. Over the years we have sometimes deviated from the recipe but stick close to the principles of slow cooking the meat in the marinade until the sauce thickens. In this case we didn't even have time to make a marinade because I was too impatient to wait, and had also substituted a soy sauce-mirin based marinade to keep it Japanese. 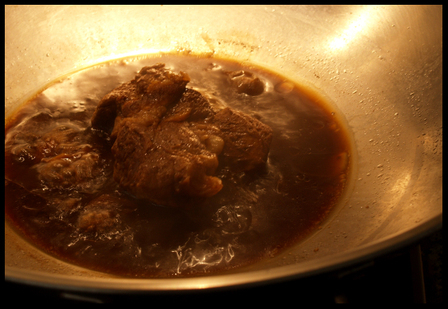 The recipe for the braised char-siew is provided here. For the Hybrid Rolls "recipe" please scroll past the next three images. Mix marinade ingredients until desired taste. I always taste the marinade, just make allowances for it to be sweeter in the end when the liquids evaporate. Make enough of it to allow the chunk of meat (pork shoulder or belly) to wallow happily in. Marinate overnight if possible. If the meat is not marinated it looks pale like the one above. Dump marinade and meat into the wok and let it simmer slowly. 40 minutes to 1 hour, depending on thickness of meat. Or you could keep stirring to move things along. Halfway through. 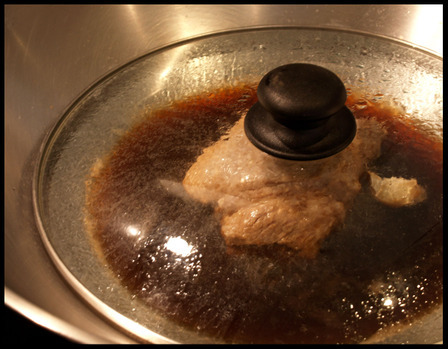 if the meat is far too cooked in your opinion you could also take it out and thicken the sauce before returning the meat for its final glaze. Final product. The meat is tender yet has taken on the flavours of the marinade. Continuous wok-stirring may result in a darker and thicker glaze. Let it cool before slicing. It freezes well. If using it for Hybrid Rolls hand-shred into long chunks. While the pork braised, the rice was cooked, omelet made and vegetables sliced. Su-Lin's tip about not using too much rice was very helpful. 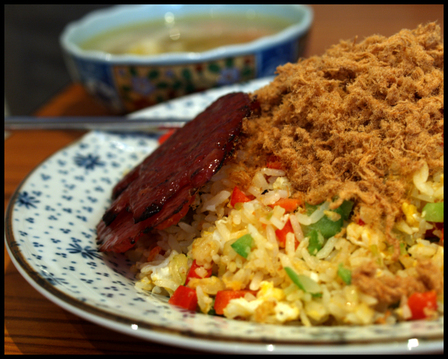 Here we have, from left to right, omelet, West Country Rhubarb & Ginger Extra Jam, peppers, carrots, shredded char-siew with sesame seeds and scallions on top of seasoned rice. The jam was an inspired touch, I had bought in Borough Market in London months ago and it was languishing in the fridge because its gingery taste was far too strong to go with our usual morning toasts and scones. Here, it was the perfect substitute for the pickled gingers that may accompany sushi and the sweet-spiciness played off very well against the soy-heavy pork. Roll away from yourself, pressing firmly with each turn. They can be eaten in the roll form, or cut into cross sections so one can admire their colourful pattern. It was delicious, and fun to make. Now, if only I had some of my mum's ikan bilis sambal, that plus cucumber strips and chopped peanuts would make a good nasi lemak version. Kimchi pork, maybe? Braised shitake mushrooms. Shredded tuna. Pork floss. Tempura anything. The possibilities are endless. Now, if only I can think of a cleverer name for them. 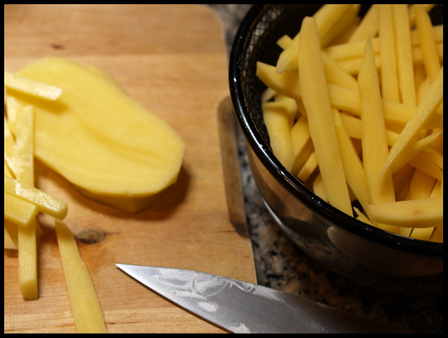 I pottered into the kitchen to get a glass of juice, and saw GG cutting up potatoes. Her favourite food is french fries, and well, she must have missed her weekly quota because she was absolutely intent on getting her fix right there and then. I grabbed the camera and started recording. In the background we also have a subplot of Vera, Rufus and their quest for a pig-shaped bak-kwa. The result: It wasn't that fantastic, even with twice-frying. Tasted of potatoes, with a nice crunch outside but was a lot more oily than expected. Still, we ate them up quick. The clean up was not fun, all that transferring and draining and stirring generates plenty of oil splatters. But with more practice and some streamlining of work process I am sure we can come up with something better. Berlin is the home of currywursts, or at least that's what I read somewhere. 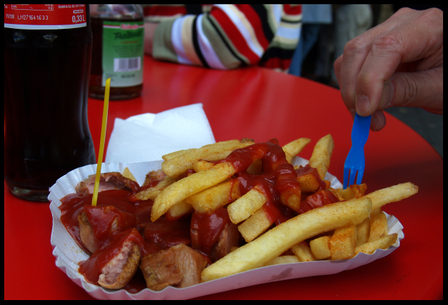 As husband had escaped eating it the first time I wasn't about to let him get away again, so when we saw a stall outside KaDeWe we bought a serving of currywurst mit pommes frites. In the end though, we spent more time taking the picture than eating it. 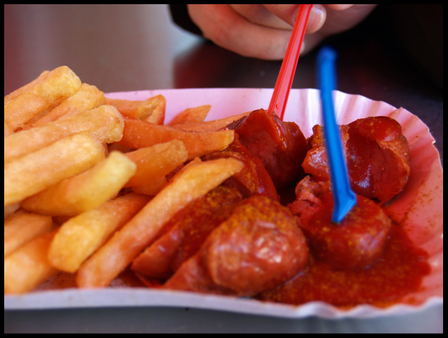 No, I am wrong, I did not even eat the currywurst, the sausage was as plastic as the forks I had no choice but to spit my first bite out. Our guidebook did say though, that Curry 36 serves the best version in town. We duly made out way over to this area that doesn't have much of an attraction -well, other than a cemetery and as you probably know, Chinese people never visit cemeteries on holiday no matter how famous it is- save for this hallmark snack. It is easy to find, just take the underground to Mehringdamm and surprise, it's at number 36 along the road of the same name. Many others were already crowding the stall by the time we arrived. 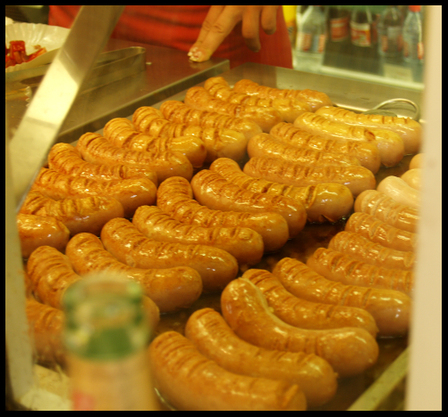 Through the window we saw the sausages cooking. The sausages already have knicks cut into them which is interesting, I don't remember other stalls doing this step. And the sausages actually looked normal and hmm, appetising. 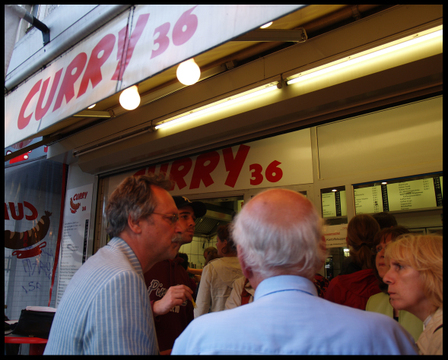 After standing for nearly 20 minutes under that big orb of deep-fried smoky oily miasma we finally emerged with a plate of currywurst mit pommes frites and a bottle of Coca-Cola and stood ourselves at one of the tall tables. Was it worth all our trouble? Yes, absolutely. The sausages were meaty and juicy with a nice snap when bitten into. The frites were quite OK, as in they were of the frozen type but freshly fried in an oil that didn't seem too stale, and were well salted throughout. The only thing I didn't like was the tomato ketchup, it had an offputing sandy mushy texture with zero taste. The curry powder that was sprinkled over both the ketchup-ed and unketchup-ed parts was also surprisingly not harsh or grainy, quite pleasant actually. In no time at all we had finished our snack, and husband even declared a liking for it. After eating and drinking, we returned out empty bottle to the cashier and guess what? They returned us some coins. Incidentally, at home we're now back to drinking regular Coca-Cola now, the Diet/ Light version that we get in France tastes more chemical than cola so I thought it best to go for the real sugar version instead. Another place that is worth mentioning is Monsieur Vuong. 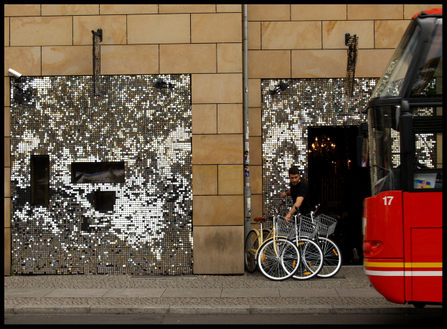 We kind of stumbled into this place while shopping in the Mitte area. Back home I googled the place and realized even the NYTimes had written about it. Anyway, we were shopping, and it was raining on and off, mainly on, and we were feeling a bit hungry because our early lunch of sushi and noodles a few street up were too spare. In that gloomy weather this cafe seemed like an oasis with its chill-pepper walls and tables crowded with people slurping noodle salads from big bowls. Be careful also, if you visit their website, or if you take their free postcards, you will be confronted with the smirking grinning face of presumably, Monsieur Vuong. It could also be the same man who darts energetically around the cafe- short, over-muscled but older than the poster image. Not important really. The other waitstaff were young Germans, they seemed a bit harried but were helpful when communicating with customers. It was crowded when we visited at the tail end of lunch time, as people came in to shelter from the rain. In one table, an old Chinese lady ate her noodles with dignified grace. In another, a group of earnest intellectual types drank their soy and health shakes, in yet another corner a strapping blond family with two mini-strapplings were handling their chopsticks with remarkable dexterity. We were lucky to snag a small table next to the bar, right in the middle of the room. 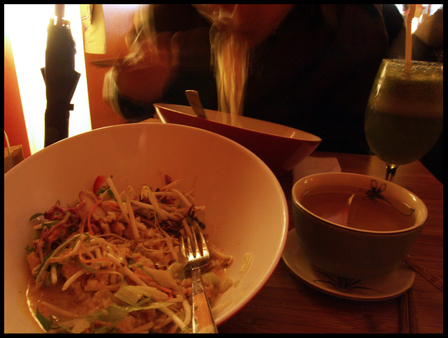 There's two types of noodles or rice salad compositions on the daily menu. Husband had the noodles with beef curry, I had the chicken with rice. I think. Honestly I can't remember the details now, but all in, it wasn't too bad. 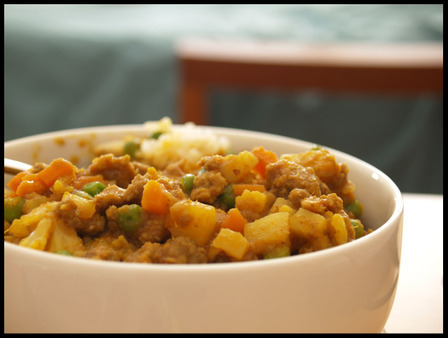 The curry components were mild yet fragrant with lemongrasses and herbs, and the heaps of raw vegetables on top would have been quite a nuisance to get through but we managed somehow. 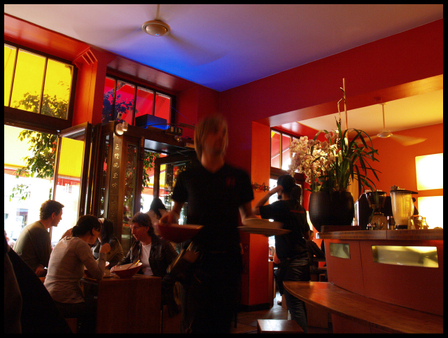 It was a welcome change from the Vietnamese joints of Paris which cannot be bothered to move on from their predictable menus, plastic tablecloths, garish figurines and offhand service. 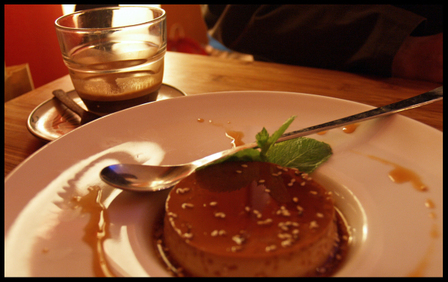 The coffee was lovely, so was a beautifully trembly-silky smooth caramel flan speckled with sesame seeds. All warm and delicious inside, we were almost reluctant to leave, but the other customers were straining to get in so we dragged ourselves away, ready for more shopping. She doesn't like cheeses but makes exceptions for the Apericubes.